Pia L. Bertucci is the author of the new novella Between Milk and India. 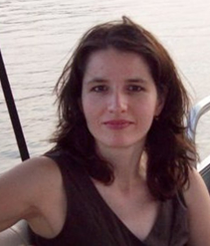 She directs the Italian program at the University of South Carolina, and she's based in the Columbia, S.C., area. 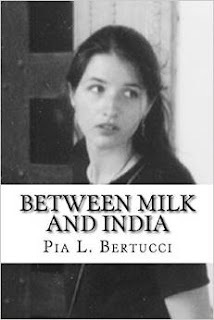 Q: How did you come up with the idea for Between Milk and India, and why did you decide to include time travel in the book? A: I actually had two different motivational streams that came together for this novel: one was largely emotional, the other creative. The emotional motivation sprang out of my reaction to my son’s decision to join the Navy. I was working through a sort of grief, trying to remain optimistic, but worried that I might somehow lose him forever. As for the time travel element, the line, “This is your life. Press ‘Enter’ to continue,” just popped in my head one day while I was driving. Over the next year or so I then began to think about how much I would love to write a story involving time travel, a concept that has fascinated me since childhood. Both streams came together after I read an article on “Quantum Entanglement” and started doing more research on related studies done by social and physical scientists. This intersection of social science with physics provided the momentum and the justification for time travel in the story. Q: Did you know how the novella would end before you started writing, or did you make many changes as you went along? A: Much to my surprise, the novella took on a life of its own. I had mapped out the story before I started writing it, but as the characters and the narrative took shape, I went in a few different directions. For example, the extent to which the protagonist Tressa Novak controls her destiny and the insight she gleans from her time travels were unexpected but happy developments. In the process, Tressa’s character and the supporting characters became more human. The trajectory of Tressa’s character really shaped the ending, which I rewrote several times before the final version. Ultimately, the ending felt very natural to me and seemed to flow effortlessly from the storyline. A: About a year after I graduated from high school, I visited Boston for the first time with a friend. We were standing on a street corner, waiting for the light to change, when I noticed the names of the intersecting streets: Milk and India. I remember that I was struck by the poetic beauty of those two names coming together. Even then, I was writing stories, and I thought to myself that one day I would write a novel with those two names in the title. Ostensibly, the intersection of the two streets is the location of the bookstore-time portal of the novella. However, as the story took shape, the two names together suggested very strongly to me an “in between” space, a liminal or parallel dimension with infinite possibilities. A: There are so many authors from diverse backgrounds whom I admire for their style, use of language, and ability to craft a story. As an Italian literature scholar, my favorites include Natalia Ginzburg, Alberto Moravia, Umberto Eco, Italo Calvino and Elena Ferrante. I would say that Calvino’s treatment of metaphysical topics and Elena Ferrante’s vivid portrayal of female characters were sources of inspiration for this piece. Writers whose narrative style I have always dreamed of emulating include, but are not limited to, Alice Munro, John Steinbeck, Joseph Conrad, Isaac Bashevis Singer, Milan Kundera, Nadine Gordimer and Isabel Allende. I am also a fan of Italian and Scandinavian detective fiction and am awestruck at the ability of these authors to construct a suspenseful story that maintains its momentum until the very end. At the same time, through the vehicle of the detective genre these writers succeed in exploring timely and pressing social issues. In this category, my favorites would include Leonardo Sciascia, Gianrico Carofiglio, Henning Mankell, Jo Nesbo, Asa Larsson and Yrsa Sigurdardottir. My interest in time travel fiction began at age 12, when I read Ray Bradbury’s “A Sound of Thunder.” A few years later, I read H.G. Wells’s The Time Machine. Both stories, Bradbury’s in particular, instilled in me a fascination with the concept of time travel that has never diminished. A: I am simultaneously working on several scholarly and literary projects. In the scholarly realm, I am finishing a chapter on Elena Ferrante and an earlier Neapolitan writer, Matilde Serao, for an edited volume on Female Identity in Italian Literature. I eventually plan to develop this chapter into a book on Neapolitan Women Writers. I am also currently writing a book on Italian Food Culture that I hope to finish this year. My current fiction project is the editing of a 400-page crime novel that I have written. This novel combines elements of Scandinavian crime fiction with Italian-American mafia lore, and intertwines two stories set 25 years apart from each other. I am optimistic that the manuscript will be ready for publication after I have completed this last set of revisions. A: I will be updating my projects and publications on my blog and Facebook page.